These lessons introduce the students to ball handling. Starting with to the floor, the children will discover the important points to catching and bouncing a ball. After they are successfully catching the ball and staying in own space, they will begin to explore manipulating the ball and moving through room space. Give your children clear expectations of what to do when you give the signal to stop. Having the children place the equipment on the floor in their own space will insure they are listening to you and not being distracted by playing with the ball. 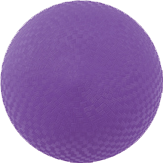 If the ball will not stay still on it’s own, ask the children to hold it still between their two feet and ankles.